John Cena’s former 2017 Ford GT heading to auction has become the new norm, like reality got stuck somewhere along the way, on a vicious loop. It’s like popping your favorite CD from 2003 into the nearly obsolete CD player in your nearly obsolete car, hoping it won’t get stuck 30 seconds into the first song again, but it does. It always does. But not this time! This time, this glorious time, a Ford GT other than Cena’s is off to auction. It’s a GT plastered with a Gulf Oil racing livery, or the “pinch of salt” equivalent in the car world—everyone uses it and no one really complains—and it’s heading to Barrett-Jackson’s Scottsdale, Arizona auction in January. No one’s going to get sued for the sale, either, because the auction item comes from the automaker itself this time around. Ford’s making a limited run of Ford GT Heritage Editions for the 2019 model year, to go along with the Heritage Editions of the car it’s made over the past couple of years as the current-generation GT has been around for a few years now. The Ford GT is Ford’s Le Mans supercar for the street, and the Heritage Edition line is full of modern iterations of the company’s Le Mans history. The Heritage Edition paint schemes started with black and silver calling back to the GT40’s win in the 1966 24 Hours of Le Mans, then moved to red and white to rub the 1967 Le Mans win in Ferrari’s face. We’re now in the age of the Gulf livery Heritage Edition, honoring the 1968 and 1969 Le Mans-winning GT40. 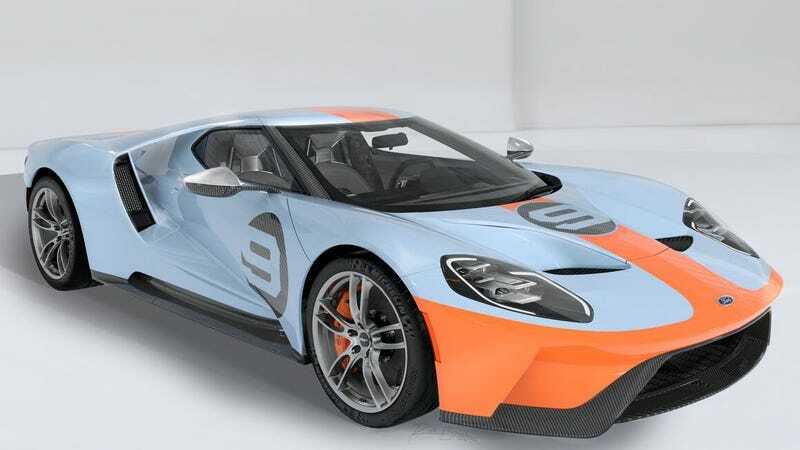 The 2019 Ford GT Heritage Edition VIN No. 001 will be in Arizona to kick off the new year, with Ford announcing it’s donating auction proceeds to United Way for Southeastern Michigan. New Ford GTs start at around $500,000 MSRP, and at auction, rogue ones from owners who broke Ford’s customer agreement to not resell the cars for two years are fetching about $1.5 million apiece. This Gulf-themed GT, in other words, will probably be a whopper of a sale. Check back next time for our regularly scheduled “Which car auction is John Cena’s former Ford GT at this week?” update, since this surprisingly wasn’t it. We look forward to seeing you there.